Former senior civil servant and chairman of the Middlesex University Board of Governors Sir Michael Partridge has today been awarded an honorary degree. He was presented with the award at the University's graduation ceremony on Wednesday 15 July. Formerly Deputy Under-Secretary of State responsible for the police department in the Home Office and Permanent Secretary of the Department of Social Security, his career as a senior civil servant spanned 35 years. Pinner-based Sir Michael joined the Board of Governors at Middlesex University in 1993 and took the position of Chairman from 1997 to 2001. Currently a Pro Chancellor for the University, he has seen several changes over his time at Middlesex, including moving from 14 campuses to a single one in Hendon, north London, which he describes as "most impressive". For many years, Michael was also the voluntary senior treasurer of the Methodist Church nationally, and, since retiring, he hasn't stopped, now filling his time serving as chairman of pension schemes and school governing bodies, and as a non-executive director for a number of companies and charities. 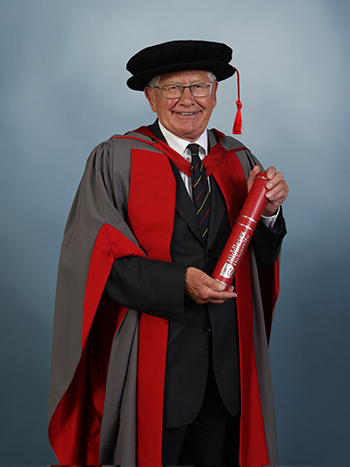 Speaking of being presented with the award, he said: "I am delighted and honoured to be receiving an honorary degree from Middlesex University with whom I have had a long association going back over twenty years. "The University has gone through some radical changes, and attained great achievements that have transformed it into the success it now is. Long may that continue." Middlesex University Vice-Chancellor Professor Michael Driscoll said: "Sir Michael is a pro-chancellor of the University. He served as a member of the Board of Governors for two decades and during his time as Chair of the Board of Governors he was a key figure in helping bring Middlesex into one campus and make it the well-established University that it is today. "We are delighted to have had Michael on the stage rather than in the audience this year and present him with this well-deserved award."